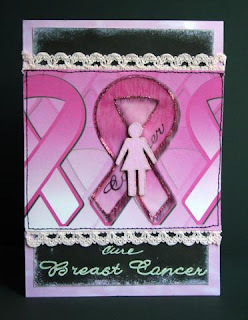 Come join us at scrap-diner.com September 26-28 for an online crop benefiting the Susan B. Komen Cancer Foundation. Spend the weekend making new friends, scrapping with a chance to win great prizes and helping to raise money for a cure for breast cancer. Plus, tell your friends and family. Let the spirit of the Diner shine! This event is in conjunction with Scrapbooks, Etc. and all donations will go to the Susan B. Komen Foundation. Cost to participate is free, but we HIGHLY recommend the donation to the Susan B. Komen Association. Donations can be made right here The Sawyer Family will personally donate an additional $5 for every person that donates $10 through the link. Together we can make a difference! As soon as Noella sent me the sketch, I knew which papers I wanted to use! Click here to see the actual sketch and to see what my fellow DT member came up with! All of the patterned papers here are Pink Paislee. TFL! "Now is your chance to pre-order this INCREDIBLE Halloween Kit featuring Pink Paislee, Pageframes and SO MUCH more!! Quantities are limited, so don’t wait! For only $47.50 CAD, this kit is overflowing! Check out the pre-orders section in our forum for a complete list of what’s in the kit, as well as to sign up and guarantee your kit today." This one comes from Helena--thank you!!! 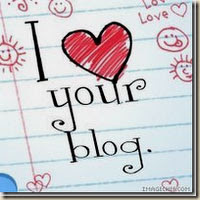 (1) The winner can put the "I :heart: your blog" logo on their blog. OK, I've nominated a few of the newer blogs that I've come across; these ladies are awesome! I have had the distinct pleasure of designing for Zsiage for the past 16 months and have recently resigned from my position. I am looking to simplify my life in some area and anticipating newer journeys in other areas. Being a member of this team has helped me stretch my abilities and soar as a scrapper and I am forever grateful to Dina for providing me with such a great opportunity! I have made a ton of fun projects using all of Zsiage's lines, here are few of my favorites! TFL! Just a little taste of the upcoming challenge at ---->DREAMGIRLS<---- There's another fabulous RAK with this one, too! Today is the last day to link or email your Superhero LOs! I took the boys to the park yesterday as part of our "hangout week" before I return to work this coming Monday. Of course I took a ton of photos and these are just a few of my favorites. 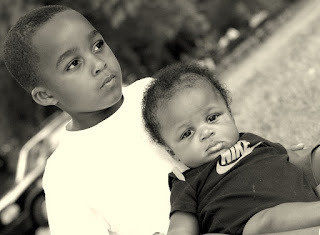 Do you know how difficult it is to get kids to look in the same direction? I like how this one turned out though- Xan and Donnie look so much alike! I just saw a picture of Donovan at 4 1/2 months (same age as Xander and the resemblance is uncanny- the only difference is Xan is browner than Donnie). My little daredevil. 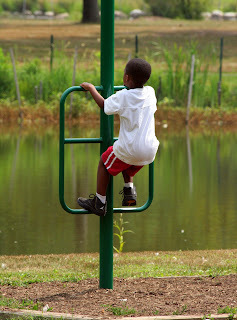 He found a new use for all of the exercise stations in the park. My goodness he's getting so big, I can remember just 2 summers ago, he was so apprehensive about playing on the playground! 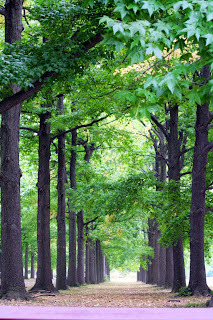 This tree line path makes me want to take a stroll! What a lucky capture! 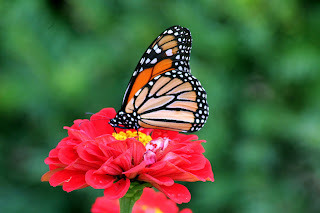 We were leaving the garden in the park and this butterfly posed just long enough for me to snap this shot. The colors are so inspiring- I feel a LO coming on with different oranges and black with white polka dots. Inspiration is everywhere! LOL! This shot makes my baby look so much older than his 4 years. I wonder what's on his mind at this moment! "Tanisha discovered a great website and wants you to be a part of it. The Star-Ledger, in collaboration with P.C. Richard & Son, is looking for the best photos of New Jersey to be put in a full-color, hard-bound, coffee-table book.Tanisha submitted a photo or two and would really appreciate you looking at it and voting for it. Everyone who submits a photo is eligible for some great prizes, and a discount on the book. The photos that get the most votes will be published in the book, so the book is truly the best of New Jersey. Registration, voting, and submission are all free, so join Tanisha and help shape the Great Destinations NJ Project today!" Can I tell you that I have been scrapping my booty off! I received some goodies in the mail that lit a fire under my mojo; in just a few days I have created 6 layouts, 2 cards, and 2 acrylic minis, sans the photos. Unfortunately I can only share a portion of what I have created- the rest has to do with some good news on the scrap front...stay tuned! LOL! My Acrylic Album ROCKS!!!!! That all I have to say! I made this LO around the gears that were part of my DT shipment this month. 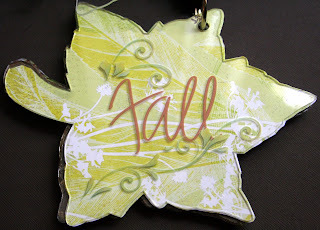 I actually ventured into heat embossing on acrylic- I think I'm hooked! These gears are so fun, especially for boy layouts and you can order them in different colors. Just plain clever, I tell ya! I had to use up some of my huge stash of Basic Grey papers before I start buying the new stuff- LOL! 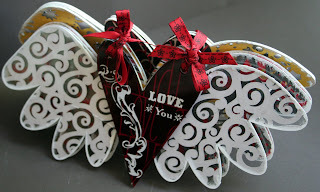 This winged heart is just an all around fun album and I loved working with it because I was able to combine 2 of my favorite products, acrylic and lace cardstock! 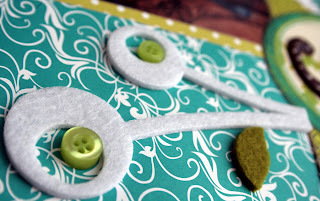 Adhering lace cardstock to each page allows you to see through each page and gives each wing very intricate detailing! I then used a sponge brush to apply acrylic paint around the edges of each wing. I left the photos out because this is going to be an "in progress" album and I will add photos of my sons as they grow throughout the year. How cute is this engraved leaf album? 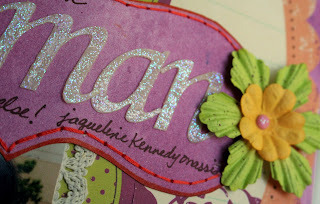 I used an embossing pen to trace the detail and then heat embossed- told ya I was hooked! 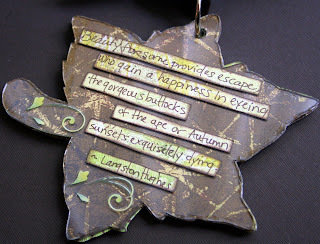 I added some Autumn quotes to the pages and I plan to add this year's fall photos to the opposite pages. MAA doesn't only carry albums, you can find acrylic stamps and this awesome ribbon ring set. This holds a TON of ribbon! I wish I had this before I spent hours putting all of my ribbon on ribbon wraps. Here's a little sneaky of 1 of the projects that I can't show until the 1st. It's getting close to the time for me to return to work. That few months went past so quickly...I really wish I didn't have to return, but I do. This morning, I visited a daycare center for Xander; he'll probably start on the 2nd so I can start work 2 weeks earlier than I had planned. Meanwhile, I'm trying to get my DT projects done because I don't know how crazy it's going to be working and then coming home to take care of 2 kids. My scrap time will be scarce, I'm sure! 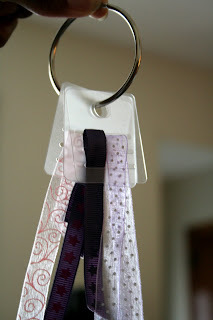 I whipped up this tag yesterday using some My Little Shoebox-it was quick and simple. I made these bad boys from scratch this afternoon. They were so yummy! 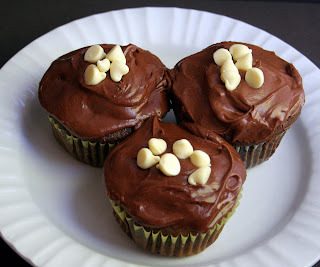 Only one problem, there are too many, if they stay in the house I will pig out on them- LOL! Y'all know I'm a chocoholic! I thought of sending them to pre-school with Donovan, but I don't know if there are enough for all of the kiddies to get one. Oh, what's a girl to do? 1. Link to the person who ‘tagged’ you! 2. Post the rules on your blog! 3. List 6 random facts about yourself! 4. Tag 6 people at the end of your post! 5. Let each person know they have been tagged by commenting on their blog! 6. Let the tagger know the entry is posted on your blog! 2. I became a mother at the age of 29. 3. I have lived in NJ all of my life. 6. I hate doing chores! We are so excited to be able to announce our upcoming chat with ALI EDWARDS. She has graciously agreed to come and chat with YOU. 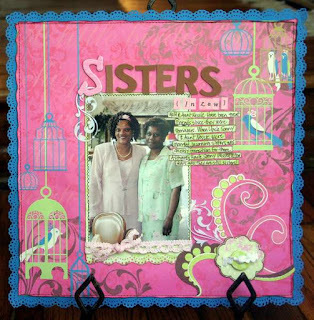 Where: Serendipity Scrapbooks chat room (under general chat) http://www.serendipityscrapbooks.com/ When: August 19, 2008 Time: 9 pm EST, 8 pm CST, 7 pm Mtn, 6 pm PST This is the perfect timing to chat with Ali Edwards and learn more about her new book that will be coming out in August. Sharing Your Story: Recording Life's Details with Mini Books by Ali Edwards Discover the fun, fast and easy way to capture and document the everyday moments of your life. With CK lifestyle editor Ali Edwards’ expertise, you’ll learn how to record the important stories of your life, store the memorabilia that matters, track the special events, make memorable gifts and more—all in the beautiful and doable format of mini books. You’ll love the dozens of practical and meaningful book ideas for every occasion. 164 pages. Available August 2008. If you are new or unfamiliar with Ali, here is a little bit about her and her accomplishments. An advocate for not making things more complicated than they need to be & embracing imperfection, Ali shares cool concepts, design, and project ideas in her idea books: A Designer’s Eye for Scrapbooking, A Designer’s Eye for Scrapbooking with Patterned Paper, Life Artist, and Sharing Your Story: Recording Life's Details with Mini Books (available August 2008). You can also find Ali's monthly column in Creating Keepsakes magazine: Studio A "I started scrapbooking in 2002 as a way to organize all the stuff I collected after the birth of my son. It has become so much more than an organizational process for me - it has let me find my own personal passion and voice. It has become all about the process of capturing life and creating art." 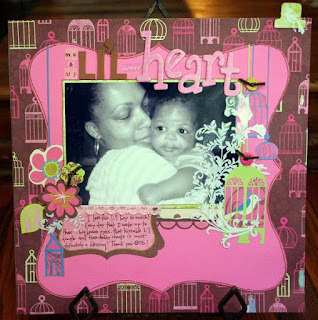 Well known for her signature style of everyday-life scrapbooking, Ali is a highly sought-after workshop instructor. She travels the US and internationally conducting classes and inspiring students to tell their stories fearlessly. Ali lives in Eugene, Oregon. She enjoys travel, reading, politics, and spending time with her husband and son. You can read more about Ali on her blog http://aliedwards.typepad.com/ We are so excited and can't wait to see you there!!! This is my first card as a card designer for creativelyyours.wordpress.com!!! I had so much fun working with Noella's sketch! 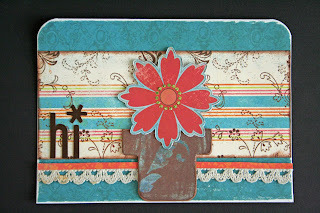 Click here to check out the actual sketch and to see what fellow card designer Krista created. All of the patterned papers are by My Mind's Eye- I used vinyl thickers (a fave of mine) and lace trim provided by savvynsassy. The "flower pot" is actually a chipboard tab by Magistical Memories, but it worked perfectly as a pot for my flower. Well the Dream Girls have done it again!! This week's challenge is going up in a bit, but I wanted to give you all a head start because you're definitely going to want to participate in this one. Our challenge to you is to scrap about a super power, this can be one that you wish you had or you can take a special ability that you have, turn it into a super power and scrap it! For a little added fun, your LO MUST include rub-ons and you MUST use a punch. This is your chance to go all out and just have fun!!!! Click on the link above to see what the Dream Girls have created! If this isn't enough to motivate you, then I'm sure the prize donated by our fabulous sponsor, My Acrylic Album certainly will! Dee has generously donated 2...yes 2 acrylic albums for this challenge! I told you this would get you motivated! Aren't these just the cutest? 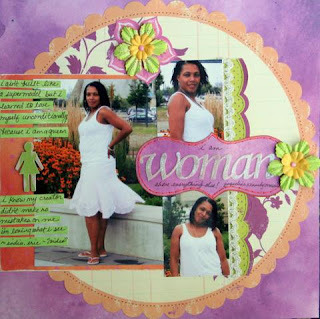 The crown acrylic album measures approximately 5" x 8" and includes 6 pages. Included are two silver colored book rings. OOOOOH, I can hear your mojo juices flowing as you're reading this post! LOL! 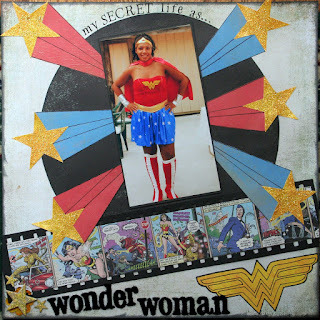 Here's my take on the challenge, it's titled "My secret life as Wonder Woman"...cute, right? I know you can all relate to that! The photo flips open to reveal my hidden journaling. It took me forever to complete this LO because of all of the manual work I had to do. The starbursts are hand drawn as is the WW symbol. 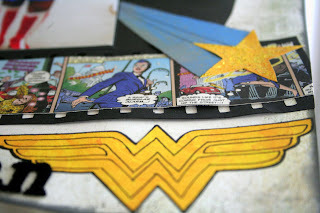 I was sooooo lucky to have found that Wonder Woman paper by Creative Imaginations a few months ago in the clearance bin at my LSS! This picture (which I'll explain) was taken last year and I knew I would eventually scrap it. Lucky, lucky me! There goes that lace again! You can find those at savvy n sassy. A card I whipped up about a week or so ago. 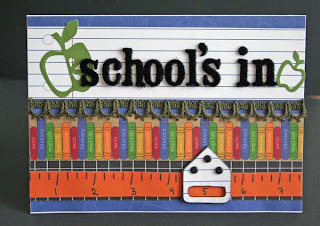 I haven't been to school in a few years, but everytime August and September roll around, I get real nostalgic for back to school which is how this card came about. 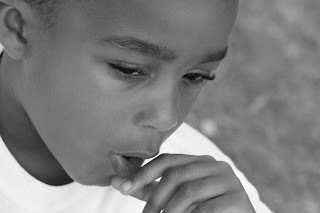 It also reminds me that this time next year Donovan will be starting kindergarten....oh where's the kleenex? I used Junkitz papers that I bought when they had their warehouse sale. 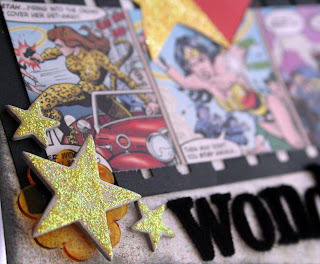 As you can see I adore those velvet letters by American Crafts, but I hate the fact that they don't stick!!!!!! I ended up having to put glue dots on them because the velvety flocking gets on the adhesive backing and messes up the stickiness. UGH! 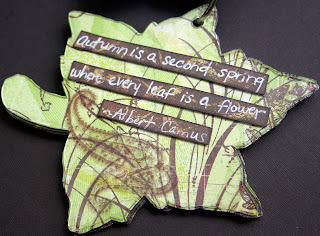 Last but not least- here's a quick little tag that I whipped up using My Little Shoebox's A little Birdie Told Me line. 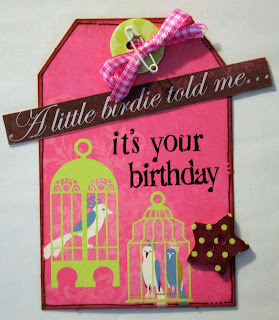 I can't say enough about how cute the birdcages on these papers are! I love it!!!!!! Newly released at CHA Summer 2008, My Little Shoebox's new line- A Little Birdie Told Me is perfect for all of your crafting needs! I just love this line, those birdies and cages are too darling. The softies alphabet stickers add the right amount of texture and how cute are those mini alphabet stickers? 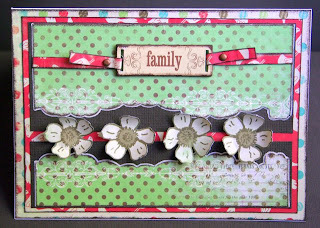 The transpaernt overlays, chipboard buttons and die cuts add the perfect touch to any project! Here are 2 projects that I created for this month's DT assignment. 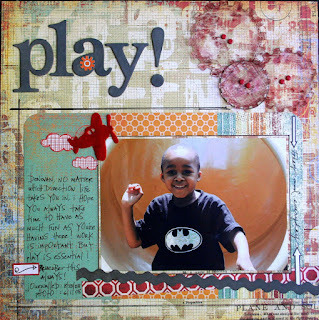 journaling: I love this li'l boy so much! Every day that I wake up to those big brown eyes, that kissable li'l dimple and those chubby cheeks is most definitely a blessing! Thank you God! journaling: Mom & Aunt Nessie have been great friends since they were teenagers. When Uncle Sonny & Aunt Nessie were married, becoming sisters was an easy transition for them. Although Uncle Sonny passed a few years ago, they are still sisters! I went a little crazy with my new Martha punch- LOL! That beautiful pink lace was provided by savvynsassy. I've created so many projects using this month's kit! There were 61 comments posted to the birthday RAK, so I decided to divide the RAK into 3 to give everyone better odds of winning- 1 in 20 is way better than 1 in 61...right?! I assigned everyone a number based on the order in which they posted and then picked 3 numbers using random.org. The numbers chosen were 40, 26, and 61 which means the winners are Cynta, TraceyT, and Helena! CONGRATULATIONS ladies email me your addresses and I will send your RAK to you! Thank you to everyone who posted and for reading my blog! "Tanisha discovered a great website and wants you to be a part of it. The Star-Ledger, in collaboration with P.C. Richard & Son, is looking for the best photos of New Jersey to be put in a full-color, hard-bound, coffee-table book. Tanisha submitted a photo or two and would really appreciate you looking at it and voting for it. Everyone who submits a photo is eligible for some great prizes, and a discount on the book. The photos that get the most votes will be published in the book, so the book is truly the best of New Jersey. Registration, voting, and submission are all free, so join Tanisha and help shape the Great Destinations NJ Project today!" When I was a little girl, I used to beg my mom to buy all of his albums. I loved his sound, his musical talents and best of all those on-the-verge-of-being-too-explicit lyrics. There's just something special about him that I love to this day! During the summer of '97, Prince came to Philly to put on a concert and Power 99 FM was giving away tickets. I wanted tickets so bad, I mean I would have done anything!! Oh, I remember it like it was yesterday. I had just graduated from college, so I was living at home and Troy was down for a visit (we were only boyfriend and girlfriend then). We both heard the advertisement to call in for tickets. He looked at me and said "you should call"- I then admitted that I had already called a few times, but the line kept ringing busy. A part of me wanted to try again, but I stalled- I remember thinking that I wasn't going to win...finally I dialed the number again and a radio personality picked up the phone and told me that I was the 99th caller. OH...MY...FREAKIN"...GOODNESS- I WON! I tried my hardest to remain calm because I didn't want thousands of people to hear me act a fool on the radio. I was squeaky and gracious and over the top excited. 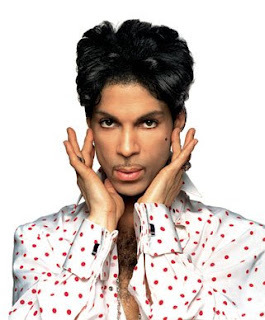 I was going to finally see Prince perform!!!! My Aunt Nessie took me to Philly to pick-up the tickets (she knew exactly where the radio station was as she had won a ton of stuff from them including a Trans-Am)! I went to the mall and picked out a skimpy fitted dress (this was before child-bearing so it fit like WHOA), invited a friend to go with me (I had won 2 tickets) and just days before my 23rd birthday, I was headed to see HIM! When we arrived at the arena and settled in our seats, I was totally disappointed because the radio station had given us super nose bleed seats! We were so far up that we had to watch the whole concert through binoculars which we had to rent! But my man Prince ROCKED THE HOUSE!!!! Two hours straight! 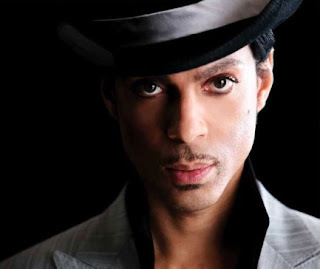 A couple of wardrobe changes, a few of my all time favorite songs, and just Prince- no other artist on the stage...just him! I danced and sang and screamed until I was hoarse! Oh by the way, I maintained my composure on the phone with the DJ for no reason- I didn't get played on the radio because she was broadcasting from a park in Philly. She did mention my name, where I was from, and that I had won the tickets. 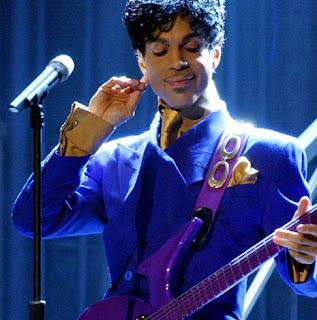 One thing I want to do before I die is see Prince in concert again! I don't have to be front row, but close enough to see beads of sweat form on his brow! LOL! 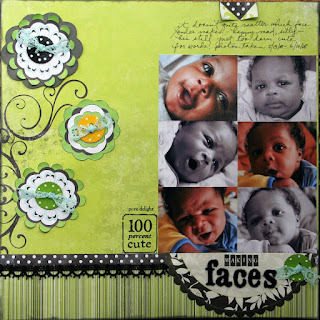 I'm participating in the Big Blog Challenge at scrapbook.com again this month. 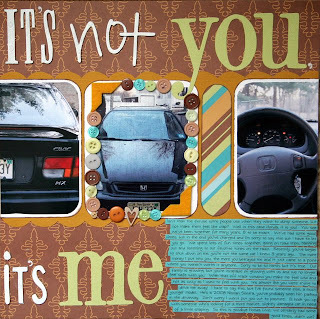 Today's prompt is to blog about your first car. I'm only on my third car, so that's a not-so-distant memory. My first car belonged to Troy- it was also his first car and when he moved on to a new car, he gave the old one to me. It was a '87 black Toyota Tercel with NO power steering and NO air conditioner; I'm sure you can only imagine what it was like during those hazy, hot, and humid, New Jersey summer days! I put up with that car for about a year or so and then bought a used '97 Honda Civic HX in 1999 right after I starting working at my current job. It was black, had 2 doors, a sunroof, CD player, but most importantly power and air! I kept this car for 8 years and then had to "break-up" with it this past January. That's what the LO is all about- it was actually published in July 2008 issue of Creating Keepsakes magazine. Now, I've moved on to a 2008 Nissan Sentra. Unlike my other 2 cars, it's blue, my favorite color! It's big enough for me and my boys and pretty good on gas. It's not quite my dream car, but it'll do for now! Today, my guys took me to lunch and then sang happy birthday to me over this super yummy chocolate cake, complete with the lights out, a candle and a wish- all directed by Sir Donovan! 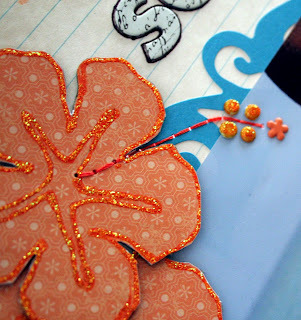 It's my birthday and I am in a generous mood...that's right, instead of receiving, I am giving...scrap goodies that is! It's my little way of saying thank you for all of the great comments, the support and well wishes. I feel pretty blessed as far as scrapping goes. 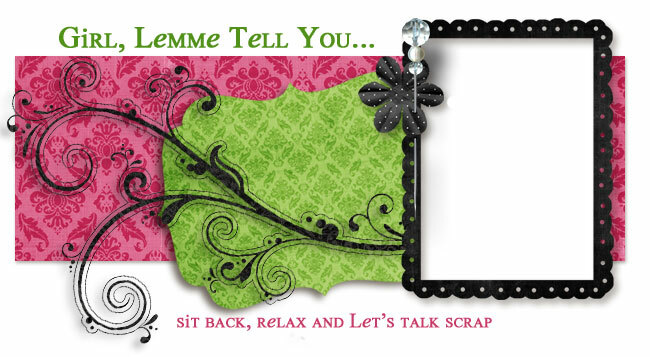 This is a hobby that allows me to express myself, record my family history in my own way, make great buddies, and receive lots of fun stuff to work with either via other RAKs, scrap purchases or design team products. I went through my stash and picked out some things from various companies that I design for (acrylic buttons from myacrylicalbum.com; paper, die cuts, chipboard alpha, and an overlay from My Little Shoebox; 6 feet of ribbon/trim from savvynsassy.com; and some scrapbook film chippies from Zsiage) coupled with a ton of Primas, old and new, buttons and some other fun stuff. Just check it out! The best part is I haven't decided how I want to split the RAK...do I want to give it all to one lucky blog poster or split it up between a couple? There's only one way to find out- post a comment here and check back next Sunday, August 10th and see if you're a winner. Everyone who posts here by the August 10th 8pm EDT will be put in a random drawing! So it's kind of like your birthday, too! I can't wait to see who wins- I just love giving happy stuff away!!!! Look at my latest LO! I love the colors, they just scream summer! Those beautiful lace trims were part of savvynsassy's August kit- they are just so yummy IRL! 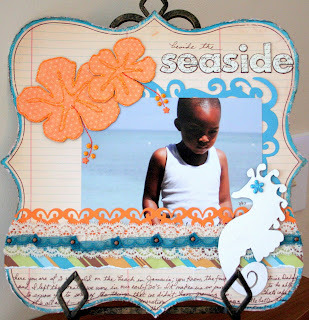 The chipboard hibiscus flowers and seahorse are from magistical memories. 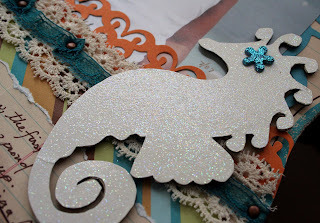 here's a close-up of the seahorse- I covered it with doodlebug's sugar coated cardstock and used a flower brad, coated with stickles for the eye. 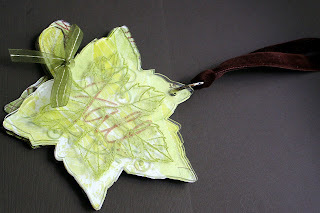 I covered the hibiscuses with MM noteworthy and added freehand details with stickles. 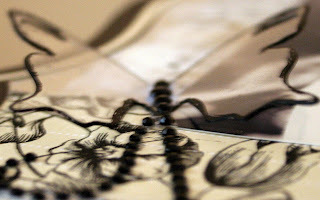 The stamen was created with hand stitching and brads. I didn't have anymore round orange brads, so I used white ones- I just covered them with butterscotch alcohol ink and orange stickles. TFL and good luck with the RAK! 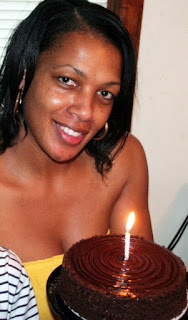 Birthday girl signing off! 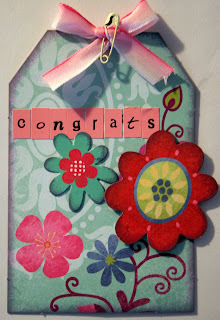 Check it out, I made the Design Team at Creatively Yours as a card designer! Woohoo!! I can't wait to work with Noella's sketches and the rest of the design team! My latest addiction is......The Food Network! I am so tired of cooking the same thing over and over again, I guess you could say I am in dire need of a little mojo in the kitchen. Anyway, I signed up to receive Rachael Ray's Newsletter- it provides you with a week's worth of recipes and the shopping list of ingredients. Doesn't get any easier than that, right? Well, I decided to try one of the recipes and it turned out so good! 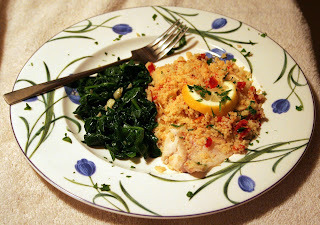 In case you are in the same boat as me, here is the recipe for tilapia baked with couscous and sauted spinach (my own recipe). It's quick, it's easy and it's delicious and bursting with flavor. 1. Preheat the oven to 375°. In a large bowl, combine the couscous, almonds, sun-dried tomatoes and cumin and season to taste with salt and pepper. Stir in the 1/4 cup olive oil and the lemon juice. 2. Drizzle 1 tablespoon olive oil over the bottom of a 9-by-13-inch baking dish. Arrange the tilapia fillets in a single layer in the dish, season with salt and pepper and drizzle with the remaining 1 tablespoon olive oil. Cover the fish with the couscous mixture and arrange the lemon slices on top. Pour 2 1/2 cups water around the fish, cover with foil and bake until tender, about 25 minutes. Top with the parsley. For the sauted spinach, add 1 clove of chopped garlic to 1 tblsp of extra virgin olive oil in a heated pan. Saute for about 1-2 minutes then add fresh spinach and saute until the spinach cooks down. I like to add a little hot sauce to my spinach for a little extra punch! I'm thinking of making another recipe scrapbook, sometime down the line- so I took a photo of my entree! LOL! Now onto to my scrap mojo- it definitely hasn't been flowing like I want it to. I guess that's one of the downfalls of being an artist, the ebb and flow of creativity. I really had to force myself to complete the following projects because they were part of my design team obligations and had to be done. - there's a great prize for one of the participants! Here's my take on the challenge. I used my favorite sparkly nail polish to coat the alpha and the brads in the center of the flower. All of the beautiful trim on these projects was provided by savvynsassy.com. Check out the sidebar on this blog to see all of the kits for this month- they're beautiful, I tell ya! 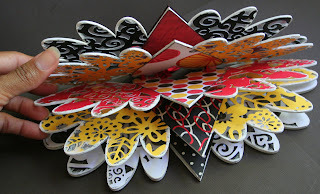 These projects were also created for my DT projects for Zsiage. close-up of my nail polish coated alpha and brad and my hand stitched title block. I created this Owl card using Zsiage's New England line. 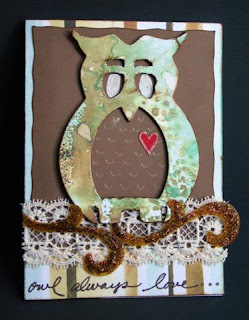 The owl is chipboard and can be found at magistical memories- if you haven't seen their chipboard before, you must!! I created this card using Zsiage's Do You Believe? line. 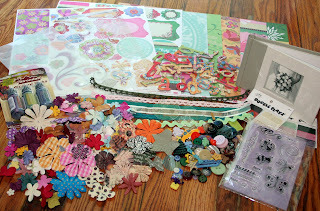 Stay tuned to my blog the beginning of next week- I will be giving away some awesome scrap goodies! !